Who is responsible for water leaks on my property? The onset of a water leak on a rental property can require some Fort Worth water line repair, which can also lead to questions about whose responsibility it is to fix the problem. The source of the issue could be traced back to either the water line or the sewer, with the bottom line being that it has to be fixed. Legally, properties have to be considered habitable for a tenant. From a plumbing perspective, that simply means that a tub or shower has to be part of the property, hot and cold water must be made available and a working toilet is present. In the latter case, problems may be caused by a Fort Worth sewer leak. In the event that Fort Worth sewer repair is necessary, it’s the property owner’s responsibility to make such arrangements. Such considerations should be spelled out in the lease agreement signed by the tenant, who has their own level of responsibility in this matter. Any detection of a Fort Worth sewer leak should result in immediate notification to the landlord by the tenant. 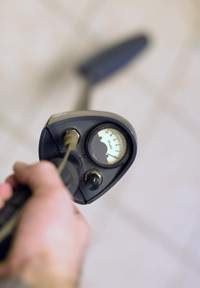 Time is always of the essence when any leaks of a sewer or water line are connected to a rental property and often serve as a determining factor when it comes to pinpointing responsibility. 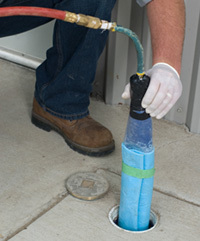 The quicker such leaks are detected, the faster that repairs are undertaken. When a toilet overflows, it’s usually caused by a clogging. This generally occurs in one of two ways: either the tenant has clogged it and done nothing to address the situation or the problem is connected to nearby tree roots or damaged pipes. If it’s the latter case, the landlord bears the responsibility for that Fort Worth sewer repair, while the tenant is considered responsible for the former situation. Even before any Fort Worth water line repair begins, the detection of the problem should result in the water main shut-off valve being immediately turned off. That eliminates the prospect of any further damage. The tenant should be shown how to turn off that valve, with that action noted in the lease, or the responsibility falls back to the landlord. If there’s nothing noted in the lease agreement, some sort of paper trail should be established for both sides when it comes to any notifications and repairs. That means that a landlord should keep track of when they were notified of a problem and the date on which the issue was fixed or resolved. By the same token, the tenant should keep track of when they informed the landlord. That can help them avoid responsibility for payment of repairs if they can show that the landlord neglected the problem. The issue of freezing pipes isn’t one that’s usually a problem in Fort Worth, yet it has happened in the past. The possibility of bursting pipes can end up requiring Fort Worth water line repair, which, in this instance, is the responsibility of the landlord. However, if the circumstances are such that the tenant failed to inform the landlord immediately, the responsibility might end up being shared when it comes to paying for those repairs. Accurate Leak & Line can address your water line concerns and is prepared to also offer its services when you need any Fort Worth sewer repair handled. We offer both traditional line and trenchless line repair and have been in business since 2002. So whether it’s a Fort Worth sewer leak, water line trouble or any other plumbing concern, make sure to contact Accurate Leak & Line today!